I have lived in my home for 8 years now and have already started going back and re-doing rooms that I first decorated when I moved in. 1st up to have an update is my living room. For the last 8 years I have been using it as a formal room for when we have guests. We have guests about once or twice a month. I realized that I am wasting an entire room for people who don't even live here and just drop by for a few minutes a month! My living room is right off of the kitchen and would be a much better place for the family to play games and watch movies together. I decided to reclaim this room! I sold the sectional on craigslist and brought up my nice big comfy sectional from downstairs. I re-painted a lighter color and also brought up our entertainment center. I took down the burgundy, blue, and green curtains (color theme from my wedding 12 years ago) I had made and put up some from IKEA. They were red and white striped and a little bright and candy cane looking so I tea dyed them. We really enjoyed our new room and after a couple of months decided to keep it as a family room. However, the entertainment center was just too huge for the small room. I found an entertainment center that I really liked at Pottery Barn, but it was out of my budget. I decided that I could make it with an old dresser. I searched craigslist and KSL classifieds for days, until I found this perfect dresser. My DH thought it was ugly, but I told him to trust me. 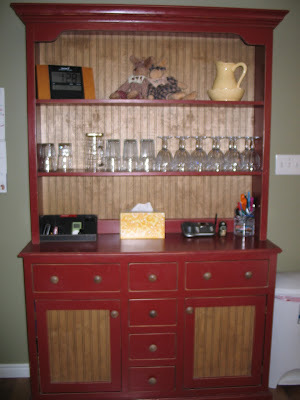 My inspiration was my buffet-hutch in the kitchen. I bought this about 7 years ago and LOVE it! It was the most expensive piece of furniture I had ever bought ($800) but I was in love and had to have it. I decorated my entire kitchen around it and now wanted to duplicate it's look in my new family room. The dresser came with a hutch and was $120 total. It was solid wood and from the SEARS Open Hearth collection. It was rustic looking and had the cutest liners in the drawers. The lining was made to look like old newspapers and really went with the look I was going for. I sold the hutch on craigslist for $20 since I didn't need it. My DH cut out the panel in the door and put in some bead board for me. He also built me a wood top to hold the DVR and put the TV on (Those sell for $250 or more at Pottery Barn). 1. I took off the handles and filled in the holes. 3. Primed it with a dark primer I already had from another project. 4. Painted it with some satin paint that I had tinted to match my buffet (2 coats). 5. Sanded down the edges to give it the distressed look. 7. Drilled new holes for some wooden knobs (wood knobs are about 50 cents each). Total cost was about $150 for everything. This is now a favorite piece of furniture in my home! I love all of the drawers for remotes, games, books, toys, etc... It is not as huge as my old entertainment center, yet it holds just as much stuff. I love just sitting and looking at it. I love having my formal living room as a family room! I am motivated to keep it clean for when guests come over; Where before it was always a mess because I knew no one would ever see it. I have turned my family room into an office/playroom and love that new space too. Sometimes you just have to think outside of the box and find what works for you. Did I mention that my favorite color is red?. After seeing what you did with your living room, I thought about doing with with ours. We have a similar floor plan, but I don't have nearly as many walls in our living room. I couldn't figure out how to incorporate the TV. But, I completely agree with the concept. My family hangs out in our living room a lot, and it seems that it's always messy, so I may as well embrace it fully and just make it officially the family room. I need some serious de-clutter help. I can't stand the clutter, but don't know how to get rid of it. It just seems to come back. Sigh. I am excited to read this blog and get inspired! W-O-W!! That is so gorgeous. I adore it! Stephanie, I only have 1 full wall in my living room. One wall has a huge window and the door, the other stairs and closet, and the one I put the TV on has a doorway. I will post pictures of my full living room (now family room) soon. Thanks Andy, that's what I think about all of your projects. I love what you've done with your living room. We too have a living room that is seldom used and have talked about putting a TV in the room. The cabinet you have now in red is gorgeous! Wow. That turned out beautifully! I LOVE the red. And you're right, you know, sometimes we get caught up in what certain rooms are "supposed" to be used for, instead of what works for our families! Thanks for linking up! I'm so glad that I found your blog! I love red too! You did a fabulous job! Love the transformation! Don't you just love the savings? I think that's what excites me more than anything! Please visit my blog and check out some of my reinventions by scrolling and browsing my blog for a while. If you like what you see, be sure to click on the "Follow" button on the right hand column so that we can inspire one another often! Wow! That is beautiful! I love the red! Wow,that's an awesome makeover Jen! I love the red!I'm going to try to join in trash to treasure next tuesday!I have really been inspired seeing what all you ladies have reinvented!It was nice meeting you. What a GREAT idea! You ROCK!!! wow! that looks terrific! I love it :) very creative!! Great job on your living room. Love the TV cabinet you made out of the dresser. Great ideas! Love & blessings from NC! Wow, what an inspiring post. Such a creative--and budget friendly--idea! Nice job. Wow, I just found that exact same Open Hearth dresser in our thrift store and we are repurposing it into a kitchen island! I agree, the lines are perfect. I love how the door makes it look less like a dresser. Yours looks beautiful. That is an amazing post, i enjoy reading the information on this blog.